We're only about a month and a half away from Portal 2's imminent release. Yes, it looks like Valve's sequel is finally going to see the light of day after a handful of delays. One reason we're such firm believers in this, the game's achievements have been revealed. Normally this means a game has been added to Xbox Live's database or played online. 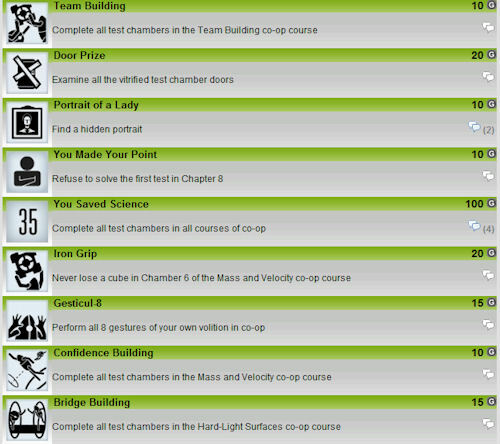 Of course these achievements will most likely mirror the Steam Achievements and PlayStation 3 trophies as well. I can feel the love already. Portal 2 is out on April 18th with a two player co-op campaign on the Xbox 360, PlayStation 3 and PC. 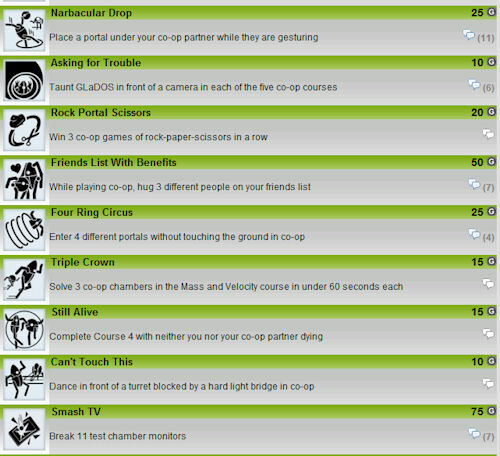 The rest of the acheivement list is available on Xbox360Achievements.org.